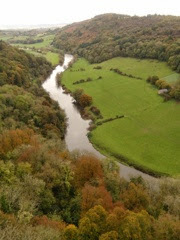 During our stay We spent the weekend in a most delightful part of the world - Symonds Yat in the Forest of Dean. We climbed to the cliff top, which is now a scheduled ancient monument. About 2,500 years ago the summit provided a good vantage point for its Iron Age inhabitants who built a fort there. Peregrine falcons build their nests in the cliffs, but we didn't see any on this trip. There's a rustic log cabin quite near the summit. 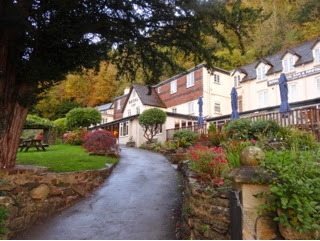 We stayed in the Royal Lodge Hotel, perched high above the winding river Wye. 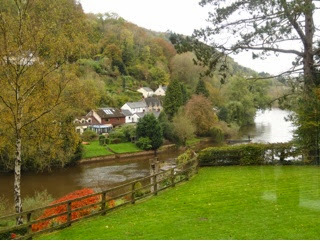 And the view from the hotel - looking over the Wye. On our way westwards we called in to Bourton-on-the-Water in the Cotswolds. 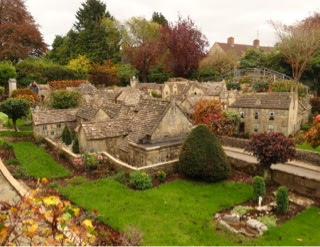 Right in the centre of the village is a model village, faithfully depicting the actual village as it is now - including keeping up-to-date with shop fronts as they change their names. It was opened in May 1937 to celebrate the coronation of King George V1 and Queen Elizabeth. 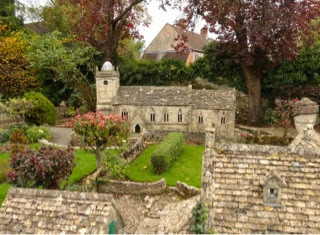 This is the church, and as we walked around the model village a peal of bells and a singing choir echoed and tinkled over the scene. 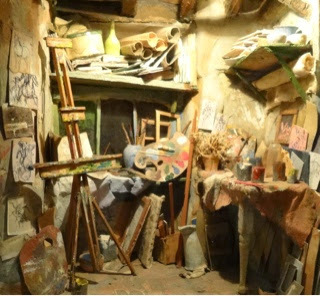 And in one of the miniature tableaux I spied this artist's untidy studio. Mind you, mine's not much better at times. 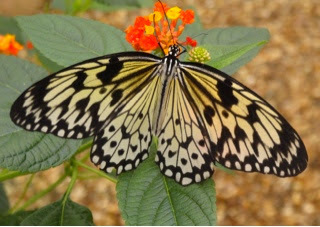 Nearby Symonds Yat is a lovely little butterfly farm. 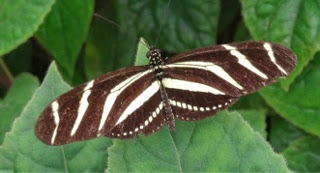 Nice to be inside and to experience the warmth and humidity of the tropics. 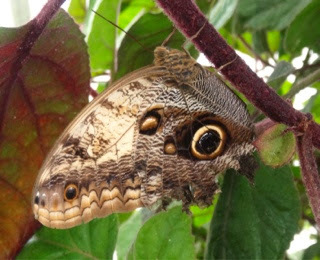 Some of the inhabitants seem to be quite tame, as from time to time they settled on us. Here are just a few of them. We've been to Hampton Court Palace in London but we discovered another Hampton Court - this time a castle. 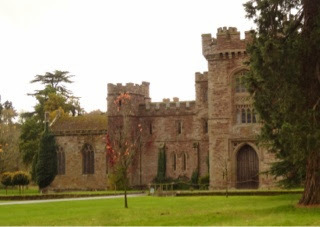 It was built in the fifteenth century on the banks of the river Lugg in rural Herefordshire. When Henry IV's cousin, Margaret Fitzalan, daughter of the Earl of Arundel, married Sir Rowland Lenthall the King gave the estate to the young couple. 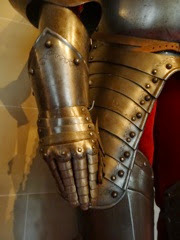 Lenthall was a favourite of the King having fought for Henry at the battle of Agincourt in 1415. The gardens are quite spectacular but unfortunately it was raining when we got there so we couldn't really appreciate them. 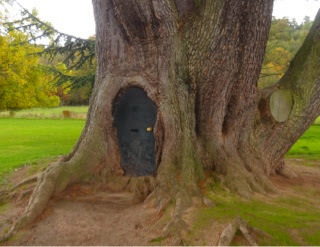 This old tree has a door, complete with brass knocker and letter box built into its trunk. 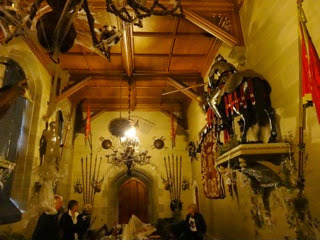 But once we went inside we were in for a treat - if a little bizarre. The Arkwright family owned the castle till 1912 but by then it was falling into disrepair and they had no money left to stave off the decay of time. 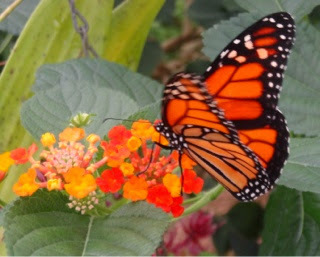 But rescue came in 1994 when Americans Robert and Judith van Kampen purchased the estate and set about restoring the historic gardens and house interiors. 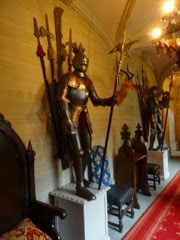 We were lucky to be only two of four given a guided tour of the castle. Preparations were underway for a few days of Halloween celebrations so cobwebs and spooky things were everywhere. 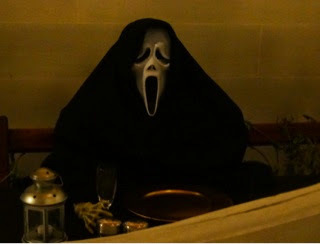 This deceased guest stared at us out of the gloom as he sat at the enormous Hogwarts-style dining room table. 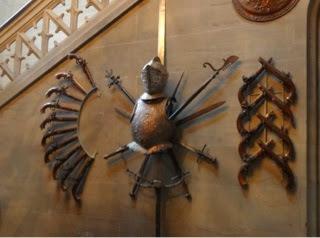 It appeared that the van Kampens had furnished the rooms in what they considered to be an authentic English Castle, so suits of armour, swords, animal heads and medieval artefacts were everywhere. Here is one of the rooms. And a corridor suitably armoured. 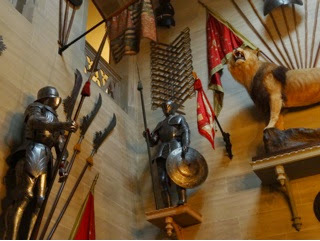 There's even a stuffed lion on one of the walls. All in all a truly fascinating tour. But sad to say Robert van Kampen died in Florida just prior to moving in to the castle, having spent several years furnishing it and totally reviving the 1,000 acres of gardens. During our stay at Symonds Yat we took a 40 minute river trip along the Wye on one of the Kingfisher cruisers and again only one other couple was aboard. We left South Wales on Sunday morning for home, calling in at Chedworth Roman Villa, one of the grandest country houses of fourth century Roman Britain. 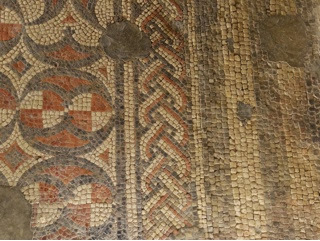 The villa was discovered in 1864 when a gamekeeper, out ferreting for rabbits, found small stone cubes - loose tesserae - from one of the buried mosaics. 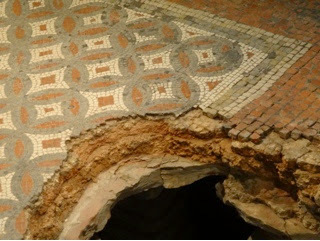 The site was swiftly dug to reveal extensive walls, bath houses and fine mosaics from one of the most significant Roman Villas in Britain. 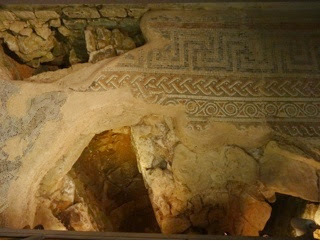 Chedworth Roman Villa was at its greatest in the fourth century, as a large and luxurious country house, with many domestic comforts such as underfloor heating and two bath houses. Here are some of the mosaics we saw. What a nice weekend we had. As we reached Bampton we paid a visit to our friend Joanne who has one of the most 'homely' homes I know. It was converted from an old cowshed! You'd never know it though. Earl Grey tea and home-made cakes were enjoyed by all.